Our conveyors are custom designed and fabricated as per the needs of the application and can be customized for dimensions &, conveying capacity required according to the material to be conveyed. We have over 30 years of experience in design & manufacturing customized conveyor systems for industrial applications. Our ISO 9001:2008 systems certified workshop is fully equiped with fabrication equipments and is located in Noida (Delhi NCR). 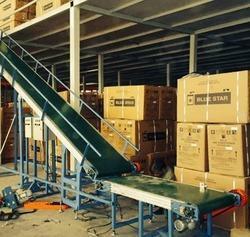 We manufacture Slat Chain Conveyor for bottling plants. Modular construction in sturdy & light weight frames. Option of flexible plastic/SS slats. 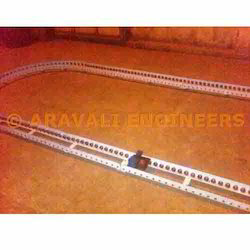 For conveying light weight products of same/different sizes. Working: Available in options of slow moving belt or intermittently stopping belt. Cleated belt design in MS/SS construction. Can be made into Z - configuration/ swan neck configuration. Mobility: Option of completely mobile units with swivel wheels. Our slat chain conveyors are well suited for conveying light & medium loads under controlled conditions. For conveying light & medium weight products in hygienic applications. Slats: Made in HCS/SS/Plastic construction with application specific surface treatments. These are low profile and light weight conveyors with smaller belt widths, typically used for Table Top Conveyor with minimum pressure. We are well-known as one of the major Conveyor Manufacturers based in India since 1987 for a wide variety of industrial applications. 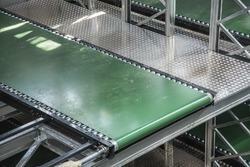 Our Industrial Conveyors have Robust construction which ensures high loading capacity with very low maintenance. 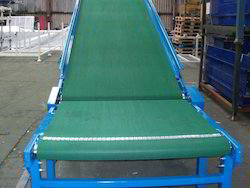 We offer Conveyors at highly affordable market price. The most common applications for which our conveyors are used are assembly, product testing, product ageing, packing, transfer, packing, truck loading, etc. We manufacture customized packing conveyor belts complete with side working platforms, rework tables, carton infeed & outfeed lines, etc. The packing conveyor belts can be synchronized with other packing machines such as strapping, shrink wrapping, labelling, etc. Our packing conveyor belts can be customized for belt width, length and other dimensions & accessories as per the product size and rate of handling. 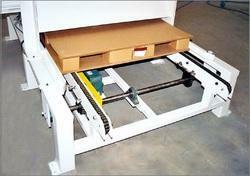 90 Degree Transfer Conveyor provide solutions for transferring pallets & unit loads between different assembly lines. 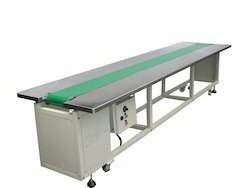 These are low profile and Table Top Conveyor with smaller belt widths, typically used for conveying jars, cartons, cans, bottles and cases with minimum pressure. 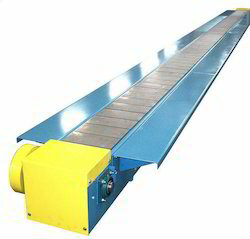 Sleek low height conveyors for trasnporting, turning, merging, diverting or accumulating products. Useful for conveying loads in between processes. Relatively simple construction and easy to mount. 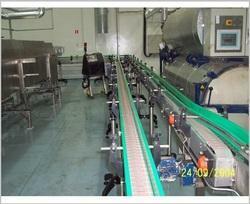 Our company is the foremost in offering Chip Conveyor to the clients. 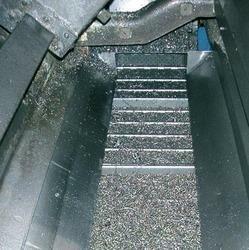 Chip Conveyor is perfect in finish and are quality checked. Offered range is tested by the quality controllers on various parameters before the delivery. This product is known for approved quality and excellent finish. 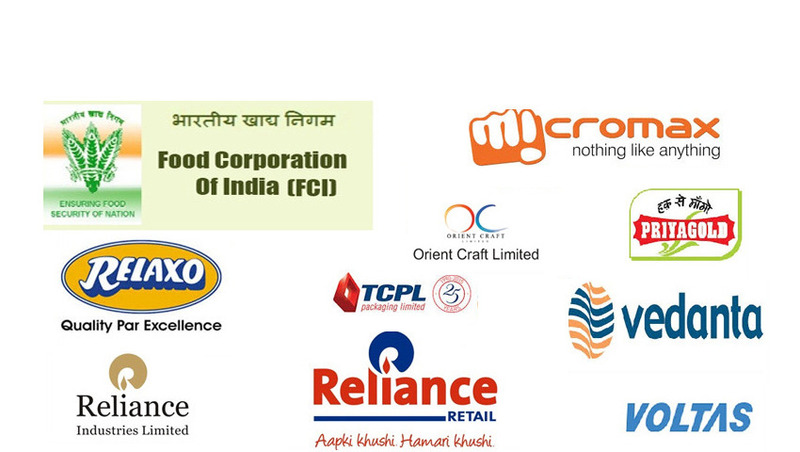 Offered range is widely demanded in the domestic markets by the esteemed customers. This product is made available in various specifications for the esteemed customers. Offered range is made by using quality approved components. We manufacture customized Industrial Packing Conveyors as per the product size and the requirement for the packing line. 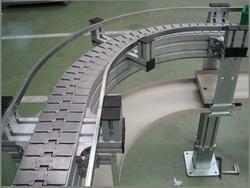 Our conveyors can be customized using different types of belts depending on the product type & load. 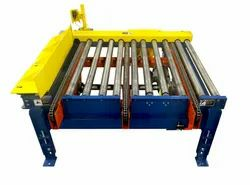 We manufacture customized pallet conveyors for loads as high as 1 tons/meter of conveyor length. Our conveyors utilize 2 or multiple strands of roller chain depending on the load to be carried. The chains used are selected from different breaking strengths and pitch for conveying. Cross transfer units for transfer of pallets from one line to another or turn tables, lifting units, etc can be seamlessly integrated. This is a custom made equipment. Please send us your requirement. We manufacture Skate Wheel Conveyors made with steel skate wheels mounted on axles to convey product. This is the most economical type of conveyor for conveying of goods in warehouses and for loading/unloading of trucks and vehicles. 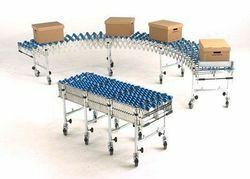 The conveyor is completely flexible and can be formed into various shapes depending on the space available. Hence, a flexible conveying path can be temporarily created anywhere inside the factory. Once the use of the conveyor is over it can be compressed to about one - third of its length and easily stored away. This is a custom made equipment. Please send us your requirements.